One of my favourite pastimes is to do a bit of research – on just about anything. I enjoy investigative work and the process of discovery. Luckily, the nature of my work at the Grant Museum ensures that there are plenty of opportunities to do museum-detective work. It could be a case of matching up an archival record with an unaccessioned specimen or figuring out a valid taxonomic name for a mysterious beast in a jar. It is both a burden and a blessing to work with historic collections which have varying degrees of documentary information: while it would be preferable to have more/most/all information about an object, gaps in the data allow for additional research and new discoveries. Recently I was doing some research on another Grant Museum Rhamphorhynchus specimen and one thing led to another…and another…and another. 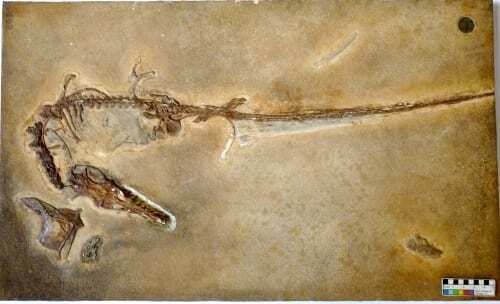 It turns out that there is a lot of history behind this week’s SOTW – and although it is ‘only’ a plaster cast – it is part of a famous lineage of one of the most famous fossil finds!